The closing of the breaches and the loss of Jay Garrick has hit the team hard. Harry and Jesse Wells must learn to cope with life on a new Earth. Caitlin throws herself into her work, closing herself off from everyone emotionally in a way that seems disturbingly familiar to Cisco. And Barry still can't shake the feelings of guilt regarding how badly he disrupted the life of his Earth-2 counterpart and cased Joe West's death. Thankfully, they'll have little time for brooding when the Earth 2 refugee known as King Shark escapes from an ARGUS holding facility. 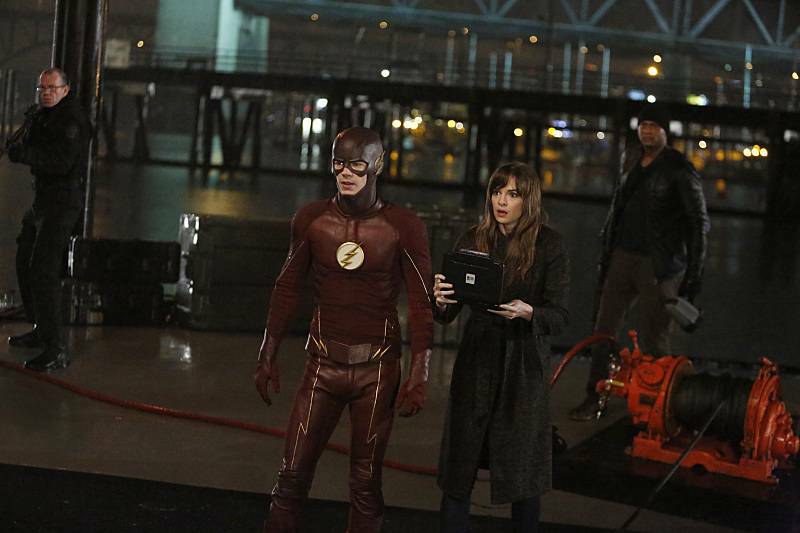 Lyla and John Diggle travel to Central City to warn Barry that King Shark is out for The Flash's blood - a problem Barry will have to cope with while trying to get to know Wally West better. Everything in this episode regarding King Shark contradicts the story-line in The Flash: Season Zero #11-18, which introduced King Shark into the reality of the show. This may not be an official goof, but it is odd since the comics were nominally meant to be set in the same universe as the show. The contradictions are noted in Flash Facts. Why does King Shark just leave The Flash there after knocking him down outside The West home? It's not like ARGUS has had any luck hurting him so far and it wouldn't have taken that much time to grab The Flash and take him as a meal to go before the ARGUS team gets there. King Shark claims to be able to track The Flash by scent yet this is contradicted by the later scenes in which Caitlin determines that King Shark was using passive electrolocation to track him. John Diggle and Barry Allen have never gotten much chance to interact in any of the various Flash/Arrow crossovers. While they still don't get a lot of time here, the brief moments where they discuss Felicity and Barry feeling closed off from her and John warning Barry against taking on too much and giving into grief are both nice scenes. David Ramsey and Grant Gustin play them perfectly. Danielle Panabaker nails it again this episode - both playing the grief-stricken, closed-off Caitlin at the start and in taking on the Killer Frost persona to prank Cisco at the end. Violett Beane is barely given any more to do in this episode than her brief scenes as a girl hostage in earlier episodes. Still, we do start to see some of the sass and intelligence that her rather mentioned here and Beane does a good job of playing Jesse Wells here with what little she is given. The special effects that bring King Shark to life may be the best in the show's history. He looks amazingly real, even in the daytime scenes. Originally a Superboy villain, King Shark had two wildly conflicting origins - one that named him as a mutant that evolved from sharks as man evolved from apes and the other that named him as a son of an ancient Hawaiian Shark God. The New 52 incarnation of King Shark is a member of the Suicide Squad and has no clear background as of yet. Curiously, The Flash: Season Zero comic introduced an Earth 1 version of King Shark in an eight-part storyline told in The Flash: Season Zero #11-18. This King Shark was a sick man named Shay Lamden, who was caught in the Particle Accelerator Explosion while undergoing an experimental treatment involving shark cells. The merger of dark matter and shark DNA transformed Shay into an ever-hungry monster, who the DCTVU version of Amanda Waller eventually recruited into The Suicide Squad. In the comic, his wife was named Christina. According to Wells, the Earth 2 King Shark was a man named Shay Lamden who was a marine biologist before the Earth 2 Particle Accelerator explosion changed him into a half-man/half-shark creature, who fell under Zoom's control. The Earth 1 Shay Lamden died on the night of the particle accelerator explosion. He apparently died after the particle accelerator explosion caused every cell in his body to grow uncontrollably for three days, turning him into something not-human. Officially he was listed as having died of cancer. His wife, Dr. Tanya Lamden, is a research scientist at Nautilus Labs, where she studies sharks. As in the comics, King Shark has super-strength, increased durability and bullet-proof skin. He swims fast enough that he can keep pace with The Flash running on water and claims to have the ability to track by scent. Harry says that the quark matter energy used to seal the breaches prevents them from being opened ever again. Ergo, there is no way of reopening them and returning to Earth 2. King Shark can only stay out of the water for a few hours before he has to return to a body of water and reoxygenate his blood. Wally developed plans for a turbine-powered supercar. The car would have an engine like the ones used on some helicopters, only it would run on bio-diesel. Barry points out the vehicle would have fuel economy issues, since the engine is basically a small-scale jet engine it will burn fuel quickly. Wally says this is why he wanted to use bio-diesel - so the car could run on anything that burns with oxygen. Barry also points out that the noise generated by a turbine-powered supercar would wake anyone trying to sleep nearby while the engine was running. Harry creates a probability distribution algorithm utilizing partial matching strategies, based on semantic trajectories (i.e. water, Central City, The Flash) to find King Shark. Jesse suggesst he also consider mobility behaviors. Wally says the hardest part of his design was amplifying the torque without increasing drag. A heavier engine would only slow the car down but the streamline version he designed should optimize both torque and horsepower. Barry worries this won't be enough and suggests a one-to-one transfer gearbox to drop the output shaft of the engine, reverse rotation and send more power to the torque converter. Sharks are predators that use passive electrolocation to find their prey. They sense the bio-electrical potential around the bodies of other fish. Caitlin theorizes that King Shark can sense the electricity in Barry Allen's body. Caitlin then suggests that they can track King Shark using active electrolocation - this is when a fish generates an electrical field and uses it to find other fish by detecting disturbances in that field. Cisco calculates that they can use the STAR Labs satellite to generate a specific electric field and then measure any electrical distortions that correlate to a one-ton walking shark. Cisco also crafts a "Flash lure" on a buoy, rigged to mimic and enhance the electric field Barry's body generates naturally. He also stuffs it with what he thinks is enough tranquilizers to put King Shark to sleep for a month. Harry crafts a container made of promethium metal to contain King Shark after he is subdued. He says it is impenetrable. When running through things that could be going wrong with the scanner, Jesse Wells asks Cisco if he set the right distortion scope. Barry ultimately defeats King Shark by using his powers to electrify the water around him, and throwing lighting at King Shark after running a circle around him. Cisco tries to adjust the wavelength trigger on Reverb's glasses to see if he can get them to work on Earth 1. Cisco suggests there is something wrong with Caitlin's circulation and that she might have Raynaud's Disease - a condition where blood flow to the hands is reduced in response to cold or emotional distress. Harry: In the meantime, I would not say anything about her counterpart from my Earth. That goes for Joe and Iris too. Harry: Because you don't want to influence their reality in ways that should not be influenced. Cisco: Like in the same way as when Barry time-travels? Harry: Exactly. But also... what's the point? None of those people - they're not you're people. Their lives are not your lives. Never were. Never will be. Bury it. Move on. Barry: (V/O) So that's what we did. We didn't talk about Earth 2. Barry: (V/O) We kept what happened there between the three of us and got on with our lives knowing there was nothing we could do now to stop Zoom. Barry: (V/O) Instead we tried to just adjust to our new circumstances. And cope with our losses. Jay's death took it's toll. It left scars on all of us. Some more than others. Barry: (V/O) And so to try and keep my my mind off thoughts of the surreal other-life I experienced that wasn't my own, I kept running. Waiting for some other metahuman threat to rear its ugly head and distract me from the frustration I was feeling. And as fate would have it, I would not have to wait long. Cisco: We're going to need a bigger Flash. Barry: I just wanna catch this thing, man... have everything with Zoom and Earth 2 put behind us so we can just move on with our lives. Diggle: You're starting to do that thing Oliver does, Barry. Carry the weight of the world on your shoulders. Gotta stop that, man. It's gonna slow you down. Cisco: You are not yourself, Caitlin. And it's freaking me out because you have this icy look in your eyes like you did over there. Caitlin: You mean Earth 2? Caitlin: (advancing on Cisco) You met my doppleganger, didn't you? Cisco: (forcing a laugh) What?! No! Cisco: Look, I'm not supposed to say anything. Cisco: Because I'm not supposed to say anything! Cisco: Okay! Fine! Yes! I met your doppleganger! She's a cold-hearted ice queen named Killer Frost! A metahuman who enjoyed killing! A lot. There! Great! Now Harry's going to kill me and throw my stuff across the room. Caitlin: Cisco... I'm not a meta-human. Caitlin: Because I have to be right now! I just watched Jay get killed! Right in front of my eyes! Just when I was starting to feel normal again. Just when I was beginning to love! So, if I let myself feel? If I let all of that pain and anger out, it's never going to stop. And that's not gonna help me either. So let's just get back to this research and figure out how to find King Shark. Joe: I don't suppose my homeowner's insurance covers a Sharknado attack? Wally: I don't understand you people. Jaws busts through your house like the Kool-Aid Man, The Flash shows up and ya'll just act like it's no big deal. Iris: Yeah, well we've had a lot of weird thing happen in Central City over the past two years. Joe: Man, you'd be surprised. Barry: I knew that it wasn't you. That none of that... was this life but... I mean, watching it happen in front of me. Living that? It didn't feel any different, because it was all still real! And Jay warned me not to get emotionally sucked in when I went there... and then that's exactly what happened. And now Joe West on Earth 2 is dead because I showed up. Joe: Barry - that's not your fault. Barry: Yeah, it is my fault. It's all my fault. Zoom? This King Shark? Jay's death? It's all because of me. And I just left an entire world at Zoom's mercy. Cisco: Just when you thought it was safe to go back in the suburbs, King Shark shows up at your house. Diggle: Look, Barry - when I was in Afghanistan, I lost a lot of friends. Brothers. So losing Jay, I know what it feels like. You question yourself. Blame yourself for his death. And that guilt, it can tear you apart, but trust me, man - you gotta get control of it or it'll rip you up inside. Use this, man. Let it guide you. So it never happens again. Barry: We're the ones who opened the door to Earth 2. We're the ones who brought Zoom here. But we are also the ones who are going to stop him. Harry: How? How are we going to stop Zoom, Allen? Barry: I don't know yet. But those breaches aren't closed forever. And we're not done with Earth 2. (Barry pulls the cover off of a glass case containing Jay Garrick's helmet) Jay's death was not in vain. We will meet Zoom again. And the next time, I will beat him. Whoever that monster is. King Shark was last seen in 204. In ARGUS code, a Code Seven is a security breach. Amanda Waller spent the last two years monitoring metahumans, looking for "assets" that could be exploited - i.e. weaponized. Barry refers to how Harry was able to track Grodd in 207 and asks him to work out a formula for predicting King Shark's movements. Cisco designed the helmet for Diggle's costume. Diggle confides that it could use some improvements, which Cisco agrees to tend to. Wally is an aspiring engineer. Reference is again made to Diggle feeling uncomfortable watching Barry run. Cisco tells Caitlin about Killer Frost. Barry tells Joe and Iris about their Earth 2 dopplegangers. Barry refers to Zoom defeating him in both 206 and 213. Joe is a slow reader. Wally finally gets his car to where it can run on collected bacon grease. Caitlin does not have the metagene. Barry puts Jay Garrick's helmet in a glass case in the middle of the main lab at STAR Labs. Zoom unmasks himself to reveal that he looks like Jay Garrick. A secret ARGUS facility in Star City. ARGUS apparently captured King Shark after Harry Wells fought him in 204. A wonderful episode and a good one to go out on before a month long break.